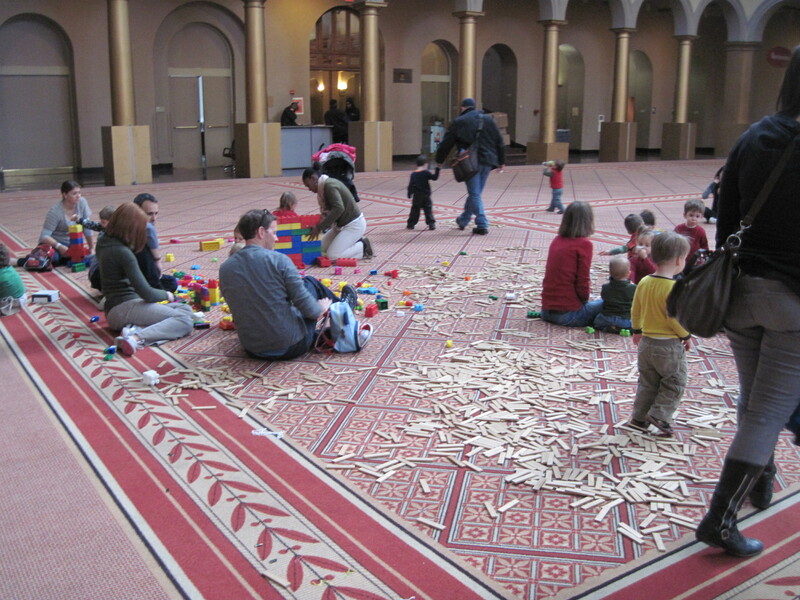 Frisco Kids: Review: National Building Museum in Washington D.C.
Review: National Building Museum in Washington D.C. This is part of a Frisco Kids series on Washington D.C. with kids. Most of the attractions in Washington D.C. are free, even if they’re not part of the Smithsonian complex. 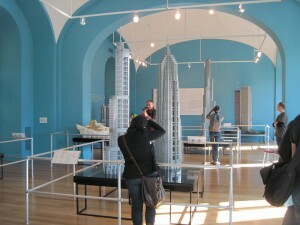 That said, here’s one museum that’s worth the money you have to pay (depending on your family/kids). 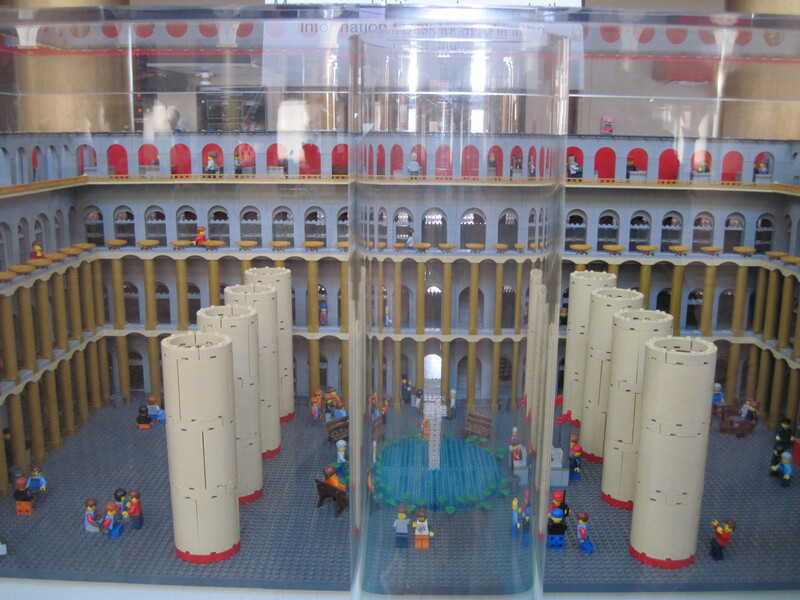 When I saw that the National Building Museum had a LEGO exhibit, I knew we had to go. 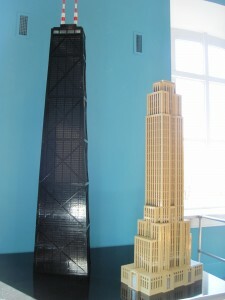 My kids love LEGOs, and frankly, so do I. The other draw is the building itself. It’s grand, with big columns, a three (plus) story ceiling, and a long history (many inaugural balls are held here). 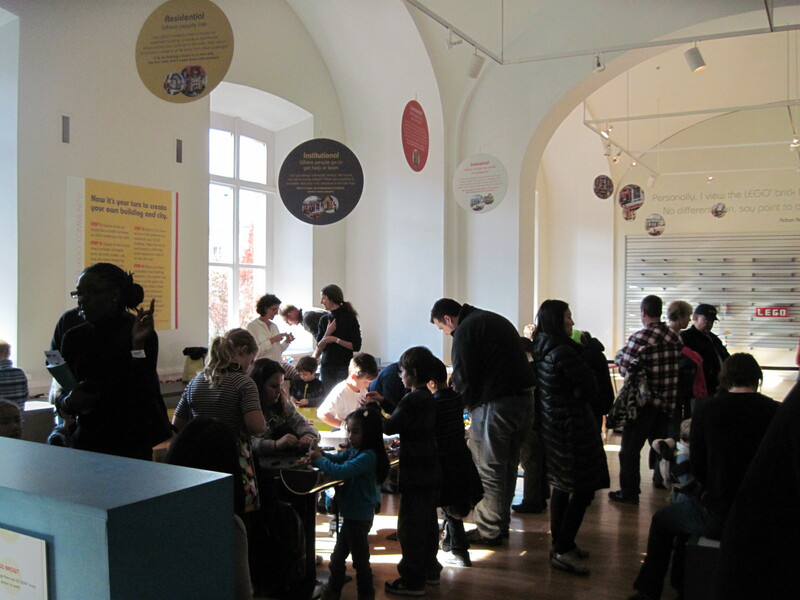 The draw for families is the LEGO exhibit, a Building Zone for young kids, and maybe a self-guided tour or scavenger hunt. 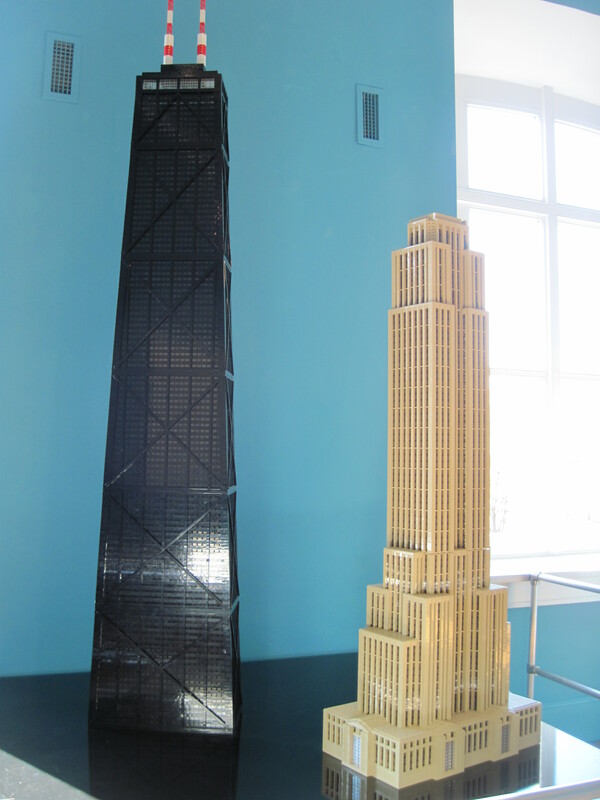 Lego Architecture: this exhibit runs through September 3, 2012 and features 15 buildings by LEGO Certified Professional Adam Reed Tucker, including the White House, Falling Water (Frank Lloyd Wright home), one of the Twin Towers, the Empire State building, the St. Louis Gateway Arch, and many Chicago skyscrapers. After spending all of 5 minutes looking at the amazing LEGO buildings, my kids ran to the LEGO play area, where they would have stayed all day if I let them. Though they can officially think about how to construct a city, and where to place everything, they just wanted to build. And that area got very crowded, very quickly! Building Zone: For kids up to age 2- 6, there’s a popular Building Zone exhibit with toys you would expect for toddlers and tots. There’s a 45 minute time limit. 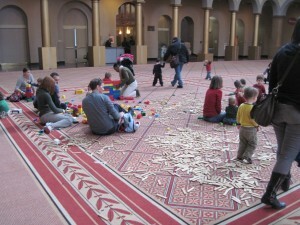 They did bring out carts with other building materials into the wide, open space for everyone to play with as well. You can just visit the Building Zone for $3, or it’s included with full ticket price. They also offer tool kits to take around the museum, and a treasure hunt activity booklet which would have been fun. The building is quirky and has hidden treasures like maps and papers in 20 of the columns. Details: Cost is $8/adults, $5/kids. There’s a café inside. 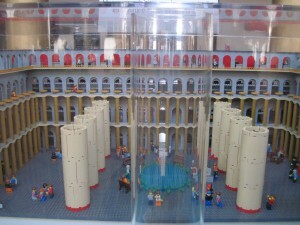 During times of high traffic, you need timed tickets for both the LEGO exhibit and the kids’ building area. The museum gift shop is fantastic, with a lot of high design items. The building is literally across the street from the Judiciary Square Metro stop – could not have been easier to find. All photos are copyrighted by Deborah Abrams Kaplan and may not be reproduced without written permission. 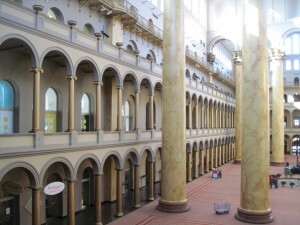 We received press tickets to the National Building Museum, but all opinions are my own.